The Asheville Outdoor Show returns to Salvage Station on the banks of the French Broad River on Sunday, September 23. The fourth annual iteration of the festival celebrating all things outdoors promises big changes. The one-of-a-kind community driven event will still feature plenty of local gear makers and national innovators showcasing the latest trend in outdoor recreation, but you’ll find far more diverse offerings of interactive demos, educational workshops, and informative speakers — including the event’s first keynote speaker. Diamond Brand Outdoors and Frugal Backpacker produce the Asheville Outdoor Show and we spent a lot of time looking at timely topics of interest to our community from supply chain sustainability to environmental protections. We’re proud to announce Teresa Baker, Founder of the African-American Parks & Nature Experience., will close out the show with a candid presentation and discussion. 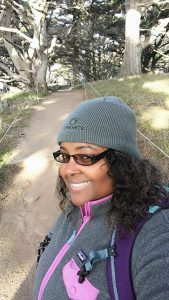 Growing up as the only sister to eight brothers in her hometown of Richmond, California, Teresa was determined not to be outdone; spending time in the outdoors became her passion. Fast-forward 30 years later and the outdoors is still her passion; the only difference is the stakes are higher. Now she spends time outdoors with the purpose of engaging communities of color in outdoor spaces, in hopes of fostering a shared sense of responsibility for environmental protection. Teresa spends the majority of her time working with outdoor agencies, organizations, and retailers, on ways to welcome a more diverse audience to their boards, staff and programs. She does this through outdoor events and speaking engagements across the country. All too often outdoor organizations, agencies, and retailers miss the opportunity to speak to the relevant role culture plays in our outdoor experiences. Teresa works to change this by connecting underrepresented communities with outdoor opportunities, knowing that the long term effect will be a new generation of nature stewards. Want more info about what to expect at the Asheville Outdoor Show? Find details as they’re announced on the Facebook page or sign up for our newsletter. In addition to the keynote speaker, you’ll have the opportunity to explore what’s new in outdoor clothing and gear, chat with industry professionals, explore the Family Adventure Zone presented by KEEN, jam to good music on the Columbia Music Stage, and enjoy the food, drinks, and hospitality of the Salvage Station crew.